In the afternoon of December 24, visitors from Seoul who came on the first Jin Air Seoul-Naha flight were welcomed at the Naha Airport international terminal. On December 24, the low-cost carrier Jin Air, a subsidiary of Korean Air, commenced regular flights between Naha and Inchon, Seoul. It was the first foreign low-cost carrier to begin a route to Okinawa. The first flight to Naha was full and 73.8 percent of capacity was occupied on the way back to Korea. 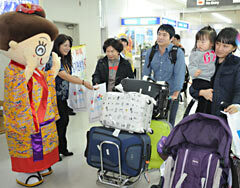 The temperature in Seoul was – 13 C, so many people visited Okinawa to spend Christmas Eve in warm Okinawa. Following on from Asiana Airlines, this is the second air carrier to commence regular flights on this route. It is the second route to Japan for Jin Air, after Seoul-Sapporo. Jin Air uses Boeing 737-800 aircraft, which have 183 seats, and operates one round-trip flight per day. During the campaign to mark the start of the new service, the lowest price of the flight was 4900 yen round-trip, but in the future it will be about 20000 yen for a round-trip, excluding fuel surcharges and tax. According to the Okinawa Prefectural Government, the annual number of tourists from Korea in 2011 was 26000 people, up to 40.5 percent on the previous year. In the welcoming ceremony held at the international terminal of Naha Airport, vice governor of Okinawa Yoshiyuki Uehara, said that Okinawa has many cultural attractions, foods and facilities that Korean people can enjoy, and he hopes to see an increase in mutual exchange. The managing director of Jin Air, Hong-Geun Chong, said that Okinawa is a beautiful place, known as the Hawaii of the East. In Korea, it has become known for holding professional baseball team training camps and as a filming location for dramas. He would like many Koreans to utilize the new service to visit Okinawa.